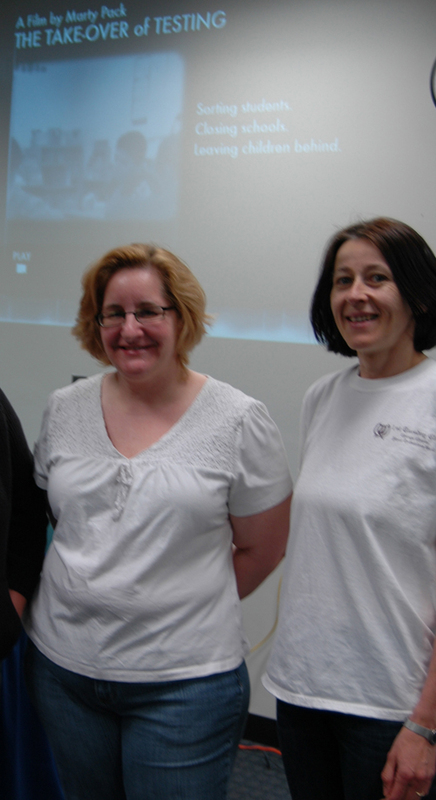 Parents who opt out: Marty Pack and Maria Pollock at the April 2010 Northeastern Illinois University showing of Pack’s film ‘The Take-Over of Testing.’ Marty regularly opts out her fourth-grade daughter from ScanTron Performance Series tests. Last year when Pollock’s daughter was a third-grader at Portage Park elementary school she opted out of the Learning First reading and math benchmark tests. The child does not attend a Chicago public school this year. Substance photo by Sharon Schmidt.It’s simple — say ‘no’ and send a good book to school with your child. However, parents will face resistance from principals. We spent much time listening to our son’s principal promote the tests. One south side elementary school principal who initially agreed at an LSC meeting to accommodate parents’ wishes to opt out their children, later pressured them to have their children take the tests, according to a teacher at the school. One north side principal told my neighbor that her child “had to take the test.” But when she sent him a copy of the Eason Watkins letter, he respected her decision. Parents need to be strong in their option to protect their children. They need to say no to the tests and insist on the chil- dren’s right to “engage in a silent, self- guided activity” during testing. As we have discussed with you and Sam will not be taking the Reading and Math Benchmark Assessments this week or on any make-up test days in the future. We will be opting out Sam from the Scantron Performance Series. When his class is tested, he is not to be tested. As per the letter we received from Barbara Eason-Watkins in March, we will provide Sam with books and writing ma- terials so he will be engaged in a ‘silent, self-guided activity’ at test times. 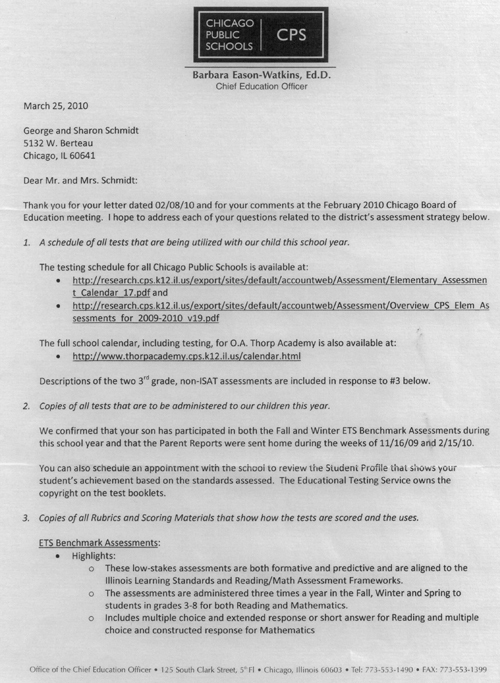 After Substance editor and parent Sharon Schmidt requested information at the February 2010 Board of Education meeting about opting out Sam from excessive testing and Substance reporter and parent George N. Schmidt wrote a letter asking for information about the tests, (then) Chief Education Officer Barbara Eason-Watkins addressed some of the issues in writing. Her letter helped the Schmidts and other parents opt out of testing for their children. 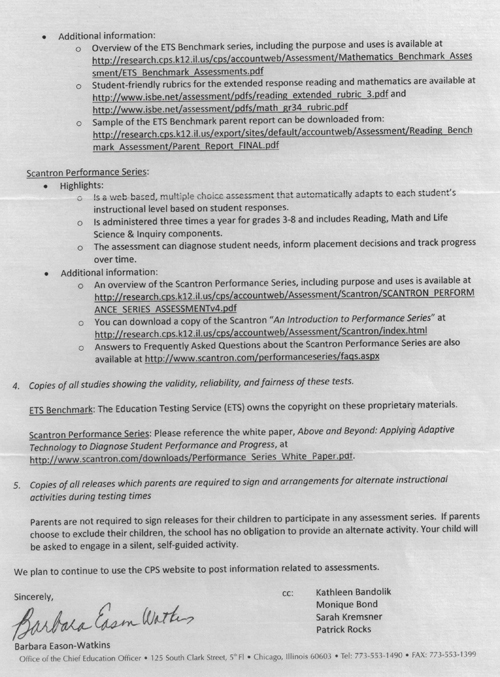 If you would like a copy sent to you, email csubstance@aol.com, subject line: Opt-out letter.The reasons we are keeping Sam out of these tests is we believe they are damaging to him and hindering his educa- tion. We are also refusing to allow him to be excessively tested because the premise of the Board of Education’s testing program is wrong. We trust the professionals who teach our children to assess our children and evaluate their learning based on their professional methods. We refuse to be a part of a program that insist our children’s teachers need data from multiple choice tests created by private companies like ETS to best teach our children. In ad- dition, we refuse to be a part of a program that judges our children’s teachers on our children’s test scores. Because MY CHILD DESERVES AN EDUCATION, I DO NOT ALLOW MY CHILD TO PARTICIPATE IN KLT AND SCANTRON TESTING. Please be advised that my child, ___________________ , will not be participating in the Scantron Performance Series testing during the current school year. I understand that the Chicago Board of Education provides the parent or guardian the right of choice regarding this standardized testing. In my opinion, such testing is not in the best interests of our children since it promotes competition instead of cooperation, and blunts, not stimulates, our children’s curiosity.